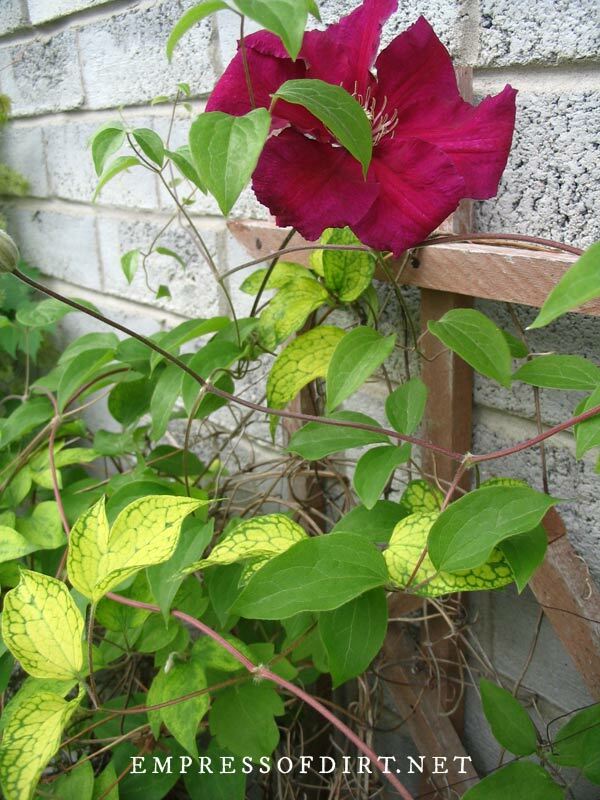 Will clematis grab onto brick?? I’m trying to cover up a brick wall so I planted a clematis. I don’t think so. You will need some sort of wire or trellis to assist it. hi I have type 1 I think, it’s pink very fragrant and gorgeous, I think we have wilt or is it supposed to look all droopy? No, droopy is not normal. It could be a variety of issues. Over and under watering are usually the first things to rule out. I can’t help diagnose it but there are plenty of online groups where you can upload pictures and ask advice, or take photos to a trusted local garden nursery and see what they think. Good luck! I love my clematis and want it to bloom as long as possible and get a second bloom on the one that does that. Should I bother with dead heading the spent blooms or just leave it alone ? I live in Ottawa, ON if that changes your advice. Hi, You need to know which type you have to understand the best pruning choices. 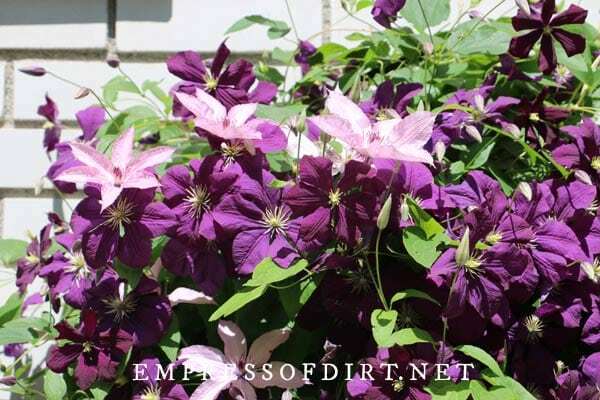 There’s a link in the post to a site that helps ID clematis if you don’t know which type you have. Any advice as how to keep it blooming? I’m not sure if you’re looking for a product or more of a long-term solution, or both. I don’t use feeds or fertilizers. First step is to ID the clematis and read up on best care for that particular type. Blooming time and how long the blooms last can vary each year depending on pruning, weather, water, and so on. I’m not sure how much of this we can control, but certainly providing good conditions and timely pruning will help. Hi, I have a Clematis that is 5-6 years old. This year, I notice a lot of leaves at the bottom of the plant turning yellow and drying out. This is happening on about 8-10 inches from the bottom of plant. I don’t see any pests, though, could you tell me what pests I should look out for. Also, could it be lack of fertilizer? Thank you. Yellowing leaves can have several causes: too litle water or too much, extreme temperature changes, or a lack of nutrients in the soil. Mine do this sometimes and sort themselves out. If you are providing a healthy growing environment (good soil, air circulation, sunlight, and adequate water), it may too sort itself out. I don’t fertlize so I can’t advise on that. 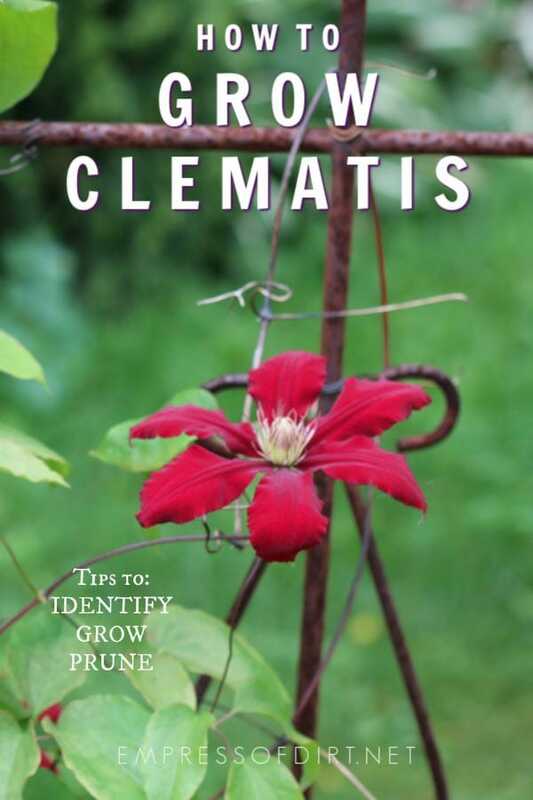 If you do, be sure you know which type of clematis you have and check advise on what to use and when. You don’t want to boost growth or blooms at the wrong time of year. Good luck! Good advice, thank you and I will continue to monitor. The temperatures have been changing radically this spring, maybe that can be to blame. Am thinking of getting PH test in flower bed. Would that help? I was so pleased to find this article. I think I have a type 2 Clematis, I was so worried after getting it last year and thinking it had died over winter to see that only the top is blooming this year. It is refusing to bloom on the old wood for some reason. I am a very new gardener having only bought my house last June and realising that I really enjoyed my garden. Is there anything I can do to help my Clematis. I have planted some Jasmine Beesianum in with it too to try and disguise the old wood an keep it look green. It is a small garden with loads of trellis, so I planted some Star Jasmin the other side of the trellis, so hopefully I will have a wonderful weave in a few years. Not to mention a lovely smelling garden. I am obsessed with climbers so learning how to really care for them would be great. I also have a cone obelisk that i have out Constance eliot passion flower and gold flame honeysuckle around. i hope it takes that are very young plants. Any advice on my clematis is greatly appreciated. In the north of the UK btw. Hi Gayle, I have no experience growing in your climate nor any knowledge of clematis that might grow there. I just know how it works here in Canada where it dies back in the winter and has new growth each spring. A local garden site, club, or nursery is probably your best resource for this question. Old thread but I want to try. Any advice on changing out a trellis and how to manage the plant and how far it could be cut back? And at what rate it would bounce back? If you can ID the plant, that would be good to know the pruning requirements. In general, when changing trellis, you have to cut it down to about a foot anyways. This is best done after flowering but if you can’t wait, you just might miss one season of flowers. I’ve had a lovely Clematis (not sure of name but early bloomer) in a pot for five years. It has loads of buds this year and some flowers already opened (smaller and greener than usual) but I’ve noticed a lot less leaves. Is this something I should be worried about? There’s lots of possible causes. 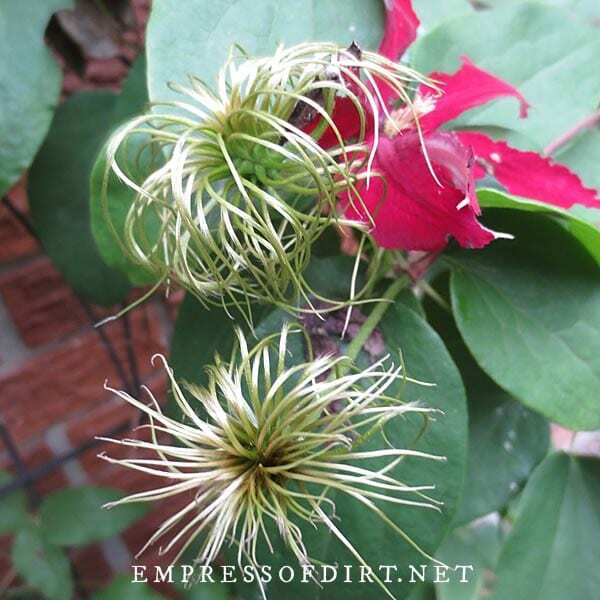 Does your clematis need repotting (is there plenty of room for the roots now)? Did the potting soil get too dry (this can cause leaves to drop)? When the leaves were emerging, did cold weather harm them? There’s also diseases and pest problems that can cause this but it could also just be a simple case of needing better housing or a dry spell that has now passed. I would make sure the conditions in the pot are good (room for roots and good potting mix suitable for clematis) and then watch and see. They don’t like to ever dry out or be too damp. Some people start overwatering after a dry spell has caused a reaction in the plant and this doesn’t solve anything. The plant just needs time and consistent conditions. Next leafing season it should be fine. The blooms start to form in the previous growing season. I leave mine alone and never use fertilizers. i sprinkle 1/4 cup epsom salts aound each plans in spring. My clematis have gotten a lot more stems and more flowers. I do it every year and am often asked why my clematis are so beautiful. I’d be curious to see what would happen if you didn’t use the salt on an identical plant nearby. 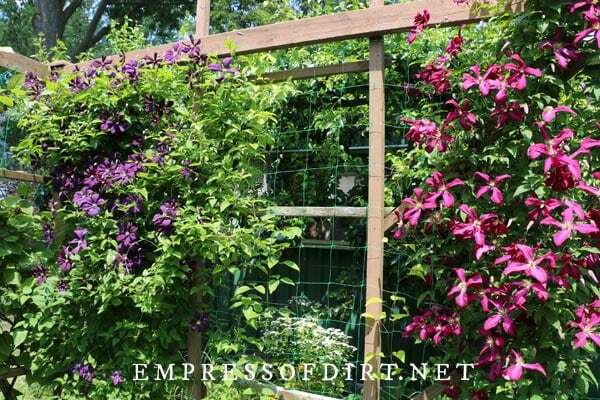 I use garden lime on my clematis at least 2 x a year so it blooms. We have clematis growing around our light pole and it has gotten very thick. Can I thin it out and if so, how do I do that. And what I take out can I replant in another area? You can thin them out at any time, though some like to wait until after blooming. Can the plant be save by the roots? One was cut by a weed eater an almost pull up. What do we do to keep it in the family? How can we propagate using a leaf/bloom cutting? Yes, you can. There’s various techniques – too hard for me to explain here but probably online somewhere. I like Carol Klein’s method in the book Grow Your Own Garden. 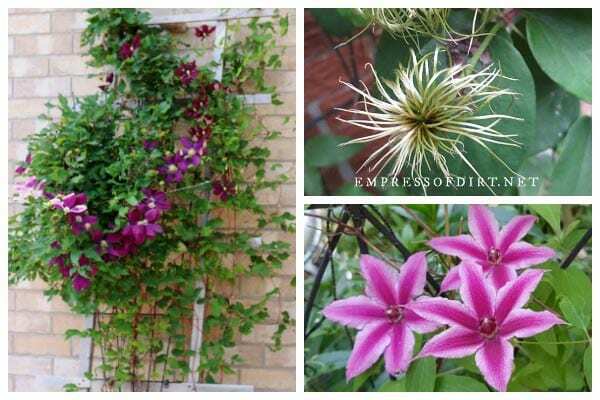 I bought my very first clematis at Lowe’s today … imagine my surprise when I checked my email and found your newsletter with this article! How cool is that!